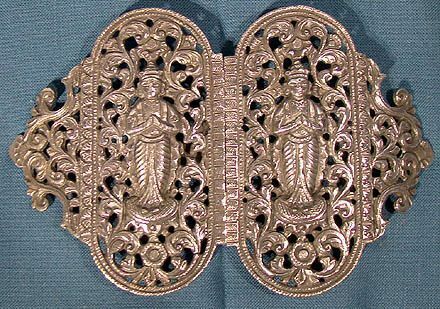 An Indonesian Yogya solid silver belt buckle from 1900 or earlier. This beautifully hand tooled openwork buckle measures 4-1/2 x 2-7/8" when the two halves are attached with their hook and eye clasp. They have one belt retention bar each and it is unsigned but tests as high grade silver. This fine fashion accessory weighs 62.2 grams and it is in excellent condition with no dents, bends, corrosion, losses, damage or repairs. All items are thoroughly and conservatively graded and all condition issues are noted; all items are vintage or antique and may have slight signs of gentle use. Expedited tracked and insured parcel shipping to the U.S. starts at $22 (other spots may vary, air is higher). Items paid with a credit card will be shipped to confirmed addresses only. We do ship internationally. All of our prices are in $US. PLEASE NOTE: We DO NOT accept PayPal. 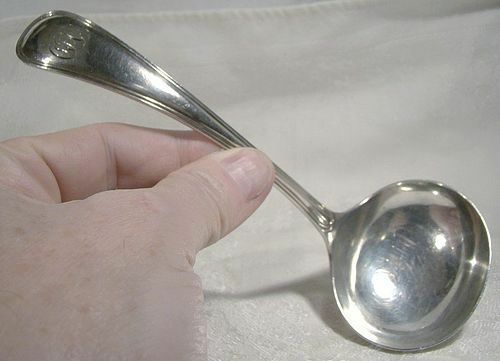 A John Round sterling silver gravy ladle made in Sheffield, England in 1911. This 6-3/4" dinnerware flatware serving piece has a pattern that matches the Birks Saxon pattern so this would be a suitable addition to that set. It is fully hallmarked for Sheffield 1911 with the John Round maker's mark. It weighs 73.2 grams and it is in verfy good condition with no dents, bends, corrosion, losses, damage or repairs however it has a script OEC monogram on the handle. All items are thoroughly and conservatively graded and all condition issues are noted; all items are vintage or antique and may have slight signs of gentle use. Expedited tracked and insured parcel shipping to the U.S. starts at $17 (other spots may vary, air is higher). Items paid with a credit card will be shipped to confirmed addresses only. We do ship internationally. All of our prices are in $US. PLEASE NOTE: We DO NOT accept PayPal. A fine example of mid-Victorian Naturalism. This is a silver plated egg stand in the form of tree branches, with the English registry mark for 1871. 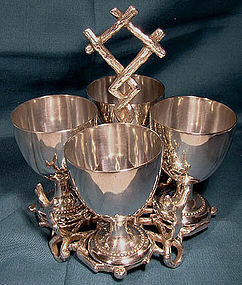 This set consists of the four silver plated 2-3/8" high eggcups and the cast metal 5-1/2" tall handled base with branches and leaves. The base measures 4-1/2" across, it has branch supports for four spoons (not present), and it has the registry mark on the bottom. Also on the bottom is a W7754 pattern number and an obscured maker's mark; it appears to have been re-plated in the past as shown by the lack of tarnish in the deep crevasses. This table serving accessory is in excellent condition with no chips, cracks, dents, bends, corrosion, losses, damage or repairs. All items are thoroughly and conservatively graded and all condition issues are noted; all items are vintage or antique and may have slight signs of gentle use. Expedited tracked and insured parcel shipping to the U.S. starts at $23 (other spots may vary, air is higher). Items paid with a credit card will be shipped to confirmed addresses only. We do ship internationally. All of our prices are in $US. PLEASE NOTE: We DO NOT accept PayPal. 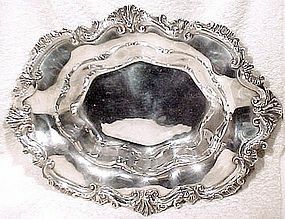 A superb and very heavy quality silver plated fruit bowl with high relief designs and scrolling c1890, made by E.G. Webster & Son of Brooklyn, New York. This bowl measures 12-3/4 x 10" and it weighs an impressive 1 lb. 14-1/2 ounces. It has the crown, lion and Prince of Wales feathers marks and a 154 pattern. This mark is sometimes erroneously ascribed to the sterling silver wares of Webster (Rainwater) but it is plated. This item is in excellent condition with no cracks, losses, dents, monograms, repairs or damage other than some tiny and shallow surface pits on the interior edge of the bottom of the bowl. It appears to have been re-plated in the past and the finish is shiny with no losses (replater's mark near factory mark). All items are thoroughly and conservatively graded and all condition issues are noted; all items are vintage or antique and may have slight signs of gentle use. Expedited tracked and insured parcel shipping to the U.S. starts at $22 (other spots may vary, air is higher). Items paid with a credit card will be shipped to confirmed addresses only. We do ship internationally. All of our prices are in $US. PLEASE NOTE: We DO NOT accept PayPal. 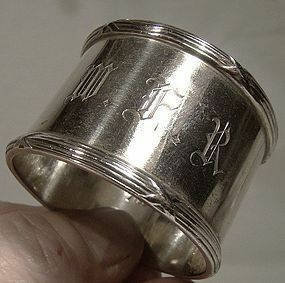 A fancy hand engraved and decorated late Victorian sterling silver napkin ring fully hallmarked for Birmingham, England 1900. 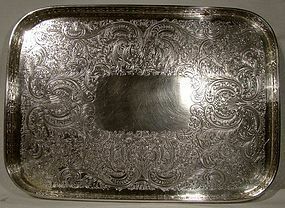 This 7/8" wide tableware piece measures 1-3/4" across the interior, it has the maker's mark for J.H. Hillcox and it weighs 9.7 grams. This item has never been monogrammed and it is in excellent condition with no dents, bends, corrosion, losses, damage or repairs. All items are thoroughly and conservatively graded and all condition issues are noted; all items are vintage or antique and may have slight signs of gentle use. Small packet air shipping to the U.S. starts at $9.50 (other spots may vary). Items paid with a credit card will be shipped to confirmed addresses only. We do ship internationally. All of our prices are in $US. PLEASE NOTE: We DO NOT accept PayPal, only VISA and MASTERCARD. A footed Reed & Barton silver plated coffee pot circa 1897. 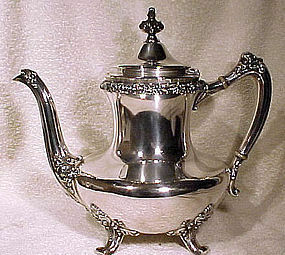 This excellent quality American silver plated 9-5/8" tall coffee pot has a high embossed design which we believe is a pattern; these hollowware go-with pieces were issued to complement flatware patterns, although we haven't identified it. It has the winged globe mark as well as MFD. & PLATED BY REED & BARTON TAUNTON. MASS. No 3646 6 PAT'D JUNE 29th 1897. This item is in excellent original condition with no losses, dents, plate wear, monograms, corrosion, repairs or damage. All items are thoroughly and conservatively graded and all condition issues are noted; all items are vintage or antique and may have slight signs of gentle use. Expedited tracked and insured parcel shipping to the U.S. starts at $26 (other spots may vary, air is higher). Items paid with a credit card will be shipped to confirmed addresses only. We do ship internationally. All of our prices are in $US. PLEASE NOTE: We DO NOT accept PayPal. 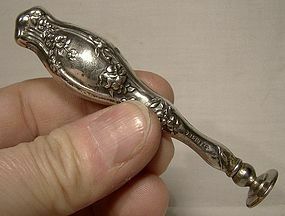 A large and heavy 8-1/2" Georgian Dublin sterling silver dinner fork, hallmarked for 1829. This heavy fork has an attractive double dolphin crest on the back of the handle and has the maker's mark for Matthew West and Peter Moore. Antique Irish silver is far scarcer than English, and this fork is a great find. This item is in excellent condition, with no dents, bends, monograms, wear, scratches, corrosion, repairs or damage other than some very light scoring on the extreme bottom ends of the tines from use. Otherwise this fork is in unusually excellent condition. Please note that our photos are taken before these items are polished to enhance detail; they will appear better than our scans and will be shipped to you cleaned and polished. They are strictly graded and any defects and wear other than the expected signs of gentle use are noted. Expedited tracked and insured parcel shipping to the U.S. starts at $23 (other spots may vary, air is higher) - tracking and insurance is included in shipping quotes. Items paid with a credit card will be shipped to confirmed addresses only. We do ship internationally. All of our prices are in $US. PLEASE NOTE: We DO NOT accept PayPal, only VISA and MASTERCARD. 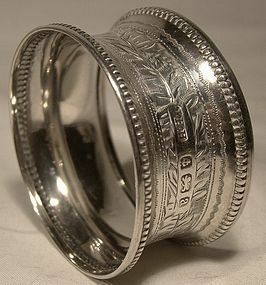 A 1-3/8" wide and 1-1/2" across the interior sterling silver napkin ring c1900-20. 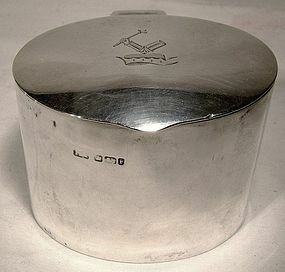 This table decoration has a JLR script monogram, it is stamped with the Roden sterling mark and it weighs 21.9 grams. It is in good condition with no corrosion, losses, damage or repairs other than two dents and some slight out-of-roundedness. All items are thoroughly and conservatively graded and all condition issues are noted; all items are vintage or antique and may have slight signs of gentle use. Small packet air shipping to the U.S. starts at $9.50 (other spots may vary). Items paid with a credit card will be shipped to confirmed addresses only. We do ship internationally. All of our prices are in $US. PLEASE NOTE: We DO NOT accept PayPal, only VISA and MASTERCARD. An Edwardian sterling silver oval English sterling silver hinged box fully hallmarked for Sheffield 1901. This antique 2-1/2" tall and 2-7/8" wide box has a tightly fitting lid, it has an arm and mace armorial engraving and it has the maker's mark for Atkin Brothers (Harry Atkin). It weighs 88.4 grams and it is in excellent condition with no dents, bends, corrosion, losses, damage or repairs. All items are thoroughly and conservatively graded and all condition issues are noted; all items are vintage or antique and may have slight signs of gentle use. Expedited tracked and insured parcel shipping to the U.S. starts at $22 (other spots may vary, air is higher). Items paid with a credit card will be shipped to confirmed addresses only. We do ship internationally. All of our prices are in $US. PLEASE NOTE: We DO NOT accept PayPal, only VISA and MASTERCARD. A fine Edwardian 3-7/8 x 3-1/2" cedar lined square style hinged sterling silver cigarette box fully hallmarked for Birmingham, England 1912. This box has the maker's mark for S. Blanckensee & Son Ltd., it weighs 307 grams and it has a Gothic Y.L.B.(?) monogram. 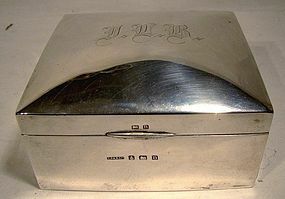 It has a cloth-covered base and it is in excellent condition with no bends, corrosion, losses, damage or repairs other than a pinpoint dent on the lid and a slightly crumpled upper left corner on the lid. All items are thoroughly and conservatively graded and all condition issues are noted; all items are vintage or antique and may have slight signs of gentle use. Expedited tracked and insured parcel shipping to the U.S. starts at $23 (other spots may vary, air is higher). Items paid with a credit card will be shipped to confirmed addresses only. We do ship internationally. All of our prices are in $US. PLEASE NOTE: We DO NOT accept PayPal, only VISA and MASTERCARD. 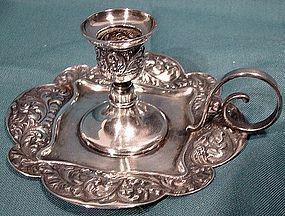 A Gorham sterling silver miniature chamber stick or candle holder dated 1891. This Victorian era ornate chamberstick stands 1-5/8" high and it measures 3-3/8" across the base. It is stamped with the lion/anchor/G mark, along with STERLING 181 and the year cypher for 1891. Although a dainty size, these small candle holders sat on a writing deak or in a travel writing desk, as they had the practical use of melting sealing wax for an envelope or document. It weighs 41.6 grams. The maximum taper width for the opening is 9/16" across. It is in excellent condition with no monograms, dents, bends, corrosion, losses, damage or repairs. All items are thoroughly and conservatively graded and all condition issues are noted; all items are vintage or antique and may have slight signs of gentle use. Expedited tracked and insured parcel shipping to the U.S. starts at $21 (other spots may vary, air is higher). Items paid with a credit card will be shipped to confirmed addresses only. We do ship internationally. All of our prices are in $US. PLEASE NOTE: We DO NOT accept PayPal, only VISA and MASTERCARD. An Art Nouveau sterling handle letter seal 1900-10. This 3-3/8" long writing accessory has no engraved monogram, it is stamped STERLING, and it is in excellent condition with no dents, bends, corrosion, losses, damage or repairs. All items are thoroughly and conservatively graded and all condition issues are noted; all items are vintage or antique and may have slight signs of gentle use. Tracked Packet shipping to anywhere in the U.S. is $14.00 - this includes online tracking, air service and insurance up to $70. Items paid with a credit card will be shipped to confirmed addresses only. We do ship internationally. All of our prices are in $US. PLEASE NOTE: We DO NOT accept PayPal. A Van Kempen Dutch sterling silver pierced serving spoon. This fine hand made and engraved Dutch sterling silver 6-1/8" pierced bowl nut or sugar sifter spoon is dated 1889. Made by Van Kempen & Sons (1858-1920) of Voorschoten Holland (The Netherlands), this serving spoon weighs 22.0 grams, and it is in excellent condition with no monograms, dents, bends, corrosion, losses, damage or repairs. All items are thoroughly and conservatively graded and all condition issues are noted; all items are vintage or antique and may have slight signs of gentle use. Tracked Packet shipping to anywhere in the U.S. is $14.00 - this includes online tracking, air service and insurance up to $70. Items paid with a credit card will be shipped to confirmed addresses only. We do ship internationally. All of our prices are in $US. PLEASE NOTE: We DO NOT accept PayPal. A stunning set of three vintage late Victorian hand hammered repousse copper nesting serving trays c1900. These unsigned but high quality trays are of thick, robust construction, and they measure 12 x 9-1/2", 16 x 12", and a whopping 20 x 15". Each has high relief floral decoration and rolled edges for strength - they weigh 2752 grams in total. 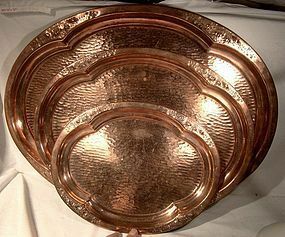 It is unusual to find one copper tray, and a set of three matching trays is rare indeed. They were polished when we obtained them and they are starting to darken now - you can polish them or let them get back to their rich original brown patina if you wish. This set is in excellent condition with no dents, bends, corrosion, losses, damage or repairs. All items are thoroughly and conservatively graded and all condition issues are noted; all items are vintage or antique and may have slight signs of gentle use. Expedited tracked and insured parcel shipping to the U.S. starts at $45 (other spots may vary, air is higher). Items paid with a credit card will be shipped to confirmed addresses only. We do ship internationally. All of our prices are in $US. PLEASE NOTE: We DO NOT accept PayPal, only VISA and MASTERCARD. 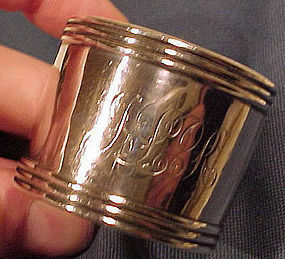 A vintage Edwardian era 1-1/4" wide sterling silver napkin ring. 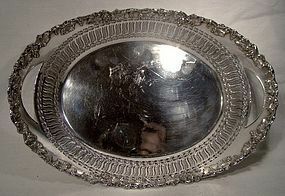 This table decoration has a W.F.R monogram, it is stamped STERLING /159, and it weighs 49.9 grams. This item is in excellent condition with no dents, bends, corrosion, losses, damage or repairs. All items are thoroughly and conservatively graded and all condition issues are noted; all items are vintage or antique and may have slight signs of gentle use. Tracked Packet shipping to the U.S. starts at $17 - this includes online tracking, air service and insurance up to $100. Items paid with a credit card will be shipped to confirmed addresses only. We do ship internationally. All of our prices are in $US. PLEASE NOTE: we DO NOT accept PayPal, only VISA and MASTERCARD. A Queensland Bulldog Club award sterling silver cream & sugar 1916. This sterling silver creamer and sugar was given as an award for the Queensland Bulldog Club Championship of 1916. This is fully hallmarked for Sheffield England 1915-16. It consists of the 5" from handle to handle open sugar bowl and the matching creamer. Each piece retains their original interior gilding and they both have the Chester mark for 1915; the sugar bowl has the maker's mark for Joseph and Richard Griffin (est. 1915-16). This set was obtained from an Australian who brought it to Canada, and we are fairly sure that Q.B.C. refers to the Queensland Bulldog Club, a dog club founded in 1915. This set weighs 94.0 grams and it is in excellent condition with no dents, bends, corrosion, losses, damage or repairs. All items are thoroughly and conservatively graded and all condition issues are noted; all items are vintage or antique and may have slight signs of gentle use. Expedited tracked and insured parcel shipping to the U.S. starts at $21 (other spots may vary, air is higher). Items paid with a credit card will be shipped to confirmed addresses only. We do ship internationally. All of our prices are in $US. PLEASE NOTE: we DO NOT accept PayPal, only VISA and MASTERCARD.